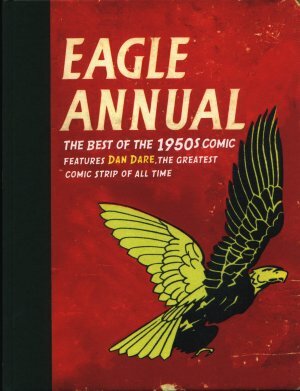 Eagle Annual - The Best of the 1950s Comic - this is the second book to review the Eagle comics from the 1950s. The books covers extracts from the comics through the decade and you can see the price of the comic rise from its initial 3d to 4½d in 1959. The comic's editors were very open in the way that they let their readers know the reason for the adverts in the comics, namely the price would be 7½d without adverts instead of 4½d with adverts. This book has its cover styled to look like a well-loved but battered Eagle Annual from the 1950's. Dimensions : 22cm x 28.5cm with 176 pages. Eagle reader Michael Lager won a bike in a competition - I wonder if he still has it? As with the previous Best of the 1950's, this book has no contents page, but neither does it have an index. Again, most of the favourites are included, if only in brief single page extracts. You can even learn the Eagle song - "Spread Your Wings". Long before Google started sending out its cars to photograph everywhere in the UK, Eagle sent out its own cars to advertise the Eagle comic and give advance information about upcoming articles and also give out coupons. One page actually suggests that you stick a pin into yourself to see where you feel pain. Imagine trying to get that article passed by Health and Safety today?